Almost every Monday-Friday for the last year and a half, I have walked past Budda C. Though I never dined there prior to last night, I always wondered about how oddly situated the restaurant is... the entrance is inside of a medical office building / apartments. Strange. 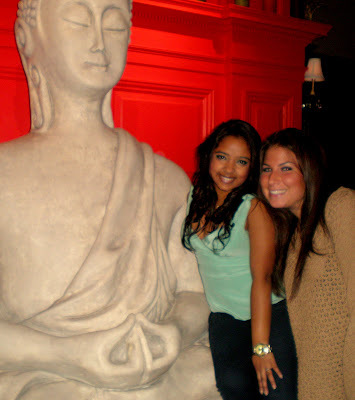 Last night, we went to Budda C for a birthday dinner. I wasn't impressed when I initially stepped into the restaurant because of the awkward entrance, but once I walked in a bit further, I saw the giant Buddha and things changed LOL. 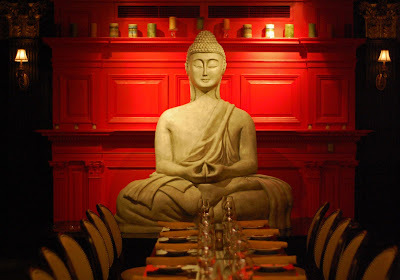 Budda C is like a well kept secret in terms of decor. You would never know how trendy and lounge-y it is from the outside. The restaurant made me feel right at home with the red walls and candles lit throughout the restaurant. The food was good. Nothing spectacular or mind-blasting (like Duozo) but nevertheless enjoyable. Sushi always hits the spot for me, especially sushi that isn't ridiculously expensive like Budda C's. To wash down the sushi, I had a lycheetini. THIS was the only disappointment of the dinner. That was probably the worst lycheetini I've ever had. Sad because I really love lycheetinis. Oh well. Anyway, Budda C is not amazing but it's not bad. Don't know that I would come again unless I want to be mesmerized by the giant Buddha again. With Fugakyu across the street, it's no wonder I never hear anything about this place!